Today our expert guest is Mark Crandall, LMSW, LCDC. He is a transformational life and business coach, a workshop facilitator, a Keynote Speaker, the author of Eulogy of Childhood Memories, and the host of Purpose Chasers Podcast. 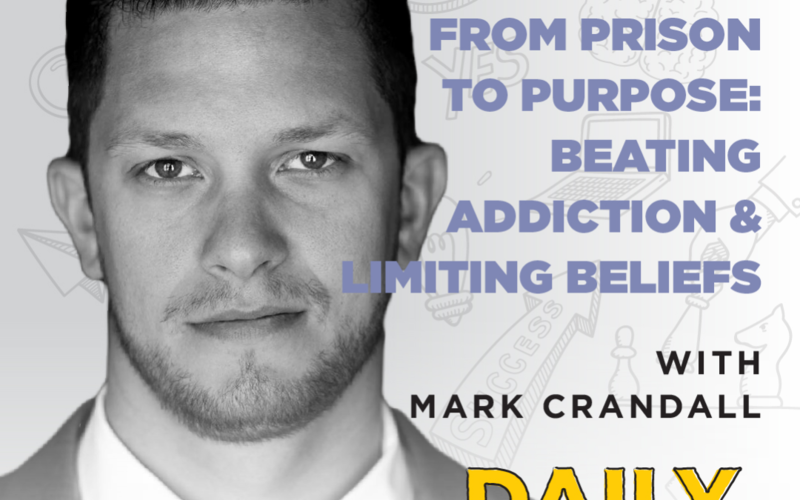 Mark went from a lost boy with countless traumatic experiences to drug addiction, prison, and an undying self-hatred to building multiple six-figure coaching practices and leading life changing workshops where he empowers others to break free from their limiting beliefs towards creating the lives of their dreams. Many people who go through what Mark has gone through end up with their lives totally derailed, forever – but Mark is now out there making a difference in the world, every single day, and that isn’t because he’s special or different. It’s because he was lucky and exposed to healthy ideas, and now he wants to help others do the same. While incarcerated, Mark was scared because he knew he didn’t have the skills to actually change the way that he thought or acted. He couldn’t even stay sober inside of prison. How could he do it out in the world? He didn’t know what that meant, at first, but he listened – and he ended up in the spirituality and self-help section. A book by the Dalai Lama stuck out to him, and later that day, he tried his first attempt at practicing a mindfulness technique. Mark didn’t know what he was seeking, but he found it. That isn’t to say that, immediately, his whole life changed and he suddenly loved himself. That would be a lie. But his life did start to change, bit by bit. Mark made another big step forward when he found Metta meditation, a loving-kindness meditation practice that really started to shift the way he felt about himself. “Once I learned to start to love other people and forgive other people, that’s when I started to reap the benefits of learning how to love myself and forgive myself.” Self-hatred will reap hatred, and self-compassion will reap compassion. Mark re-wrote the story of his life, and now, he dedicates his life to empowering others to accomplish the same.